Fathom Events and GKIDS are partnering to bring Grave of the Fireflies to movie theatres nationwide for a special three-day event on August 12, 13 & 15 as part of Studio Ghibli Fest 2018. 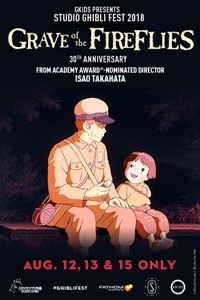 Based on the retellings of survivor Nosaka Akiyuki and directed by Academy Award®-nominated filmmaker Iaso Takahata, Studio Ghibli's Grave Of The Fireflies has been universally hailed as an artistic and emotional tour de force. Presented in its digitally remastered and restored format, it is one of the rare films that truly deserves to be called a masterpiece.